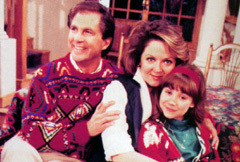 Michelle Bauer, portrayed by Rebecca Budig, is Ed Bauer's daughter and Rick's half-sister. Michelle just started her freshman year at Springfield U. She lost her first love, Zachary the Angel, thankfully. He was the biggest writing mistake on GL to date, as far as I'm concerned. She also recently mended fences with her best friend Bill Lewis, but then he disappeared from her storyline again. J Chamberlain was in love with her, but now she's dating Jesse Blue, who was the recipient of Maureen's heart. Michelle misses her adopted mother Maureen a great deal, but enjoys a special relationship with Holly Lindsay Reade and Abigail Blume. Michelle and Jesse were about to run off and elope when Michelle was caught in the fire at Reva's. They took off her bandages, but she is sure she's going to be permanently blind. Rick is the only one that knows she's actually blind, and she wants to go away to some blind school in Nebraska or somewhere and learn how not to be a burden on her loved ones. She's trying to hide her blindness from Jesse and Ed, and it's working so far, even though it is completely unbelievable to the audience! I thought the writers were going to give us a break here and let Jesse figure out she's blind (duh, Jesse! She has yet to actually look at you) but she fed him some line about eyedrops and she believed him. I don't know if this is supposed to be heartwrenching or sad at all, but it's not. If she doesn't regain her sight she doesn't want to marry him and be a burden to him. Can anyone say Dylan Lewis? Michelle lost her virginity to Jesse on New Year's Eve and then left for a blind school in Iowa. Am I the only one who didn't find their first sexual experience very romantic at all? Now I wish they'd waited, considering she was lying to him about her sight the whole time. Currently she is coming to terms with her blindness and Jesse is driving himself crazy trying to find her. Now Michelle is starting to piss me off. This blindness thing has been on for a couple weeks now, and personally I think it's high time she came clean with Jesse. Is it just me that thinks she is being totally selfish? Let's examine the facts: They slept together, they exchanged wedding vows (granted, just to one another, but it's the symbolism that counts here), and Jesse told her that she is the first person in the whole world (his own parents included) that he has ever said "I love you" to. And what does she do? Breaks his heart "for his own good". That's true soap opera form, I know, but in this case it is cruel and heartless. Jesse has every right to be mad, I wish he'd get Michelle in person and figure out she's blind, and then let her have it for lying to him and breaking his heart. He needs to let her know what she is doing is not helping him. And that's my opinion on the story, for what it's worth! Will they get married after all? Hopefully Rick will talk them into having a big Bauer ceremony at the Country Club. Last updated 1/12/98. E-mail me with any comments or suggestions.